Twelve Kings is a highly-praised new fantasy work, followed by the 2017 sequel With Blood Upon the Sand. For regular fantasy readers, this novel may not have touched your fancy as of yet. So read on, and consider reading this novel. At the very least, add it to your ‘to-read’ list. Twelve Kings (also known as Twelve Kings of Sharakhai) is the first in a series by Bradley P. Beaulieu. It tackles the creation of a new and Middle Eastern inspired world. Here, Çeda is the main heroine and the narrative follows her journey as she seeks to destroy the god-kings of Sharakhai. This connects her to her mother’s lifelong quest. 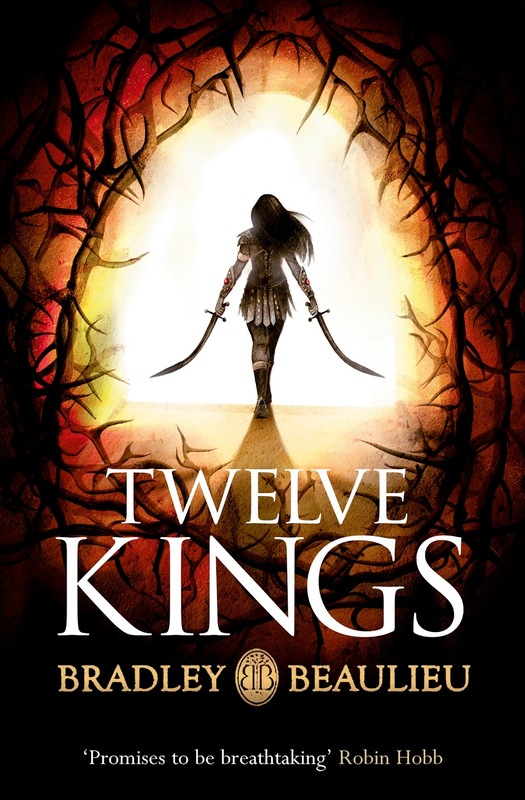 Twelve Kings is, therefore an excellent work of imaginative fiction. It begins slowly in some regards, yet this novel builds into a wonderful unfolding narrative. The novel begins with Çeda in a gladiatorial battle for financial gain. It becomes clear that the author has aimed to reveal and indicate her clear fighting spirit. And indeed despite an awkward love scene right at the beginning of this segment, Çeda develops into this type of character. This is a warning for those who find the beginning of the novel clunky and distracting. Readers should cut this first part of the series some early slack, in order to allow the narrative to develop alongside Çeda. For as the reader continues to read, it becomes apparent that Çeda is a fascinating protagonist. She is the type of female presence modern fantasy literature needs involved within itself. Her quest is a mission against the Twelve Kings of Sharakhai – the individuals who govern particular aspects of the powerful city state. Here, Çeda works to uncover the mysterious destinies of these god kings. This will enable her to defeat and destroy them. The novel hints that some other gods of Sharakhai have potentially bound their destinies to these kings, posing some interesting mysteries for the series to pursue moving further. The narrative also focuses on analysing the concept of alliances, and how Çeda works with and sometimes against her friends to any ends. Her ultimate desire is to solve the mystery of her mother’s death. Structurally, this novel moves between the past and present at regular intervals. Readers begin with the present-day version of Çeda. They then move back to the past-version of Çeda around the time of her mother’s death. This is in order to uncover the truth of how Çeda’s mother was killed. This death is a mystery which drives the present narrative. It is an interesting device, occasionally it could potentially feel awkward to some readers in its execution, but it also transforms Twelve Kings into more than ‘just another fantasy’ novel. Ultimately, this is a novel worthy of reading for any modern fantasy fan. For those who appreciate G.R.R. Martin and Brandon Sanderson there will be plenty to admire. There is also plenty to examine for those who appreciate the technical aspects of novel writing and reading. Consider adding Twelve Kings to your reading list, it should be worth your time and provide an engaging experience for the modern fantasy reader.